We’re delighted to be working with Denmark’s Lowly again – this time, at the Castle Hotel – with fellow Bella Union artists Hilang Child and Charlie Coxedge! Bella Union are thrilled to announce Heba, the debut album by hotly-tipped Danish quintet Lowly – as uniquely sensual, rhythmic and mesmerising a brand of modern pop as you’ll hear in 2017: restlessly inventive, exquisitely melodic, and defying easy categorisation. The band describe their music as ‘noise-pop, and everything in between’. In this case, ‘noise’ refers to the textures and treatments that the quintet mould from synths, laptop and guitar, which give Lowly’s spacious songs unpredictable, shape-shifting qualities, iced by Nanna Schannong and Soffie Viemose’s radiant voices – all brilliantly layered by the band and co-producer Anders Boll, Efterklang’s long-trusted engineer/soundman. Two independently released singles found their way outside of Denmark, inspiring the Guardian to include Lowly in a ‘Five must-listen new tracks from around the world’ round-up, while The Line Of Best Fit swooned to an ‘idyllic, height of summer sonic landscape… total bliss… Nordic pop does not get bigger’. 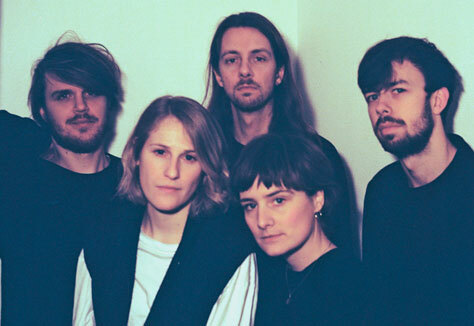 Having tracked the band for a year, it was after seeing Lowly play the Spot festival in Aarhus that Bella Union skipper Simon Raymonde signed the band, which made its label debut in 2015 with the Sink Way Into Me EP. But it was autumn 2016’s single Deer Eyes that confirmed the giant leap forward that is Heba. Further embellishing the album’s scope and impact are guests Jacob Danielsen on tenor sax and bass clarinet and soprano singer Anna Maria Wierød on Still Life, the album’s spinetingling opener. Local support comes from Charlie Coxedge. Charlie Coxedge, musician and writer from Manchester, is best known as a member of MONEY. As a solo musician, his compositions weave layers and loops of guitars, synth textures and soft pianos, building from melodic, ambient noises to multi-faceted soundscapes. His debut album Cloisters was released digitally and on limited vinyl via Bella Union in May.